VIDEO — Mickey Fulp: Should Investors Worry About Gold this Summer? Gold recently fell below $1,300 per ounce for the first time in 2018. Does that spell trouble for gold this summer? Last week, the gold price dipped below $1,300 per ounce for the first time this year, and since then the yellow metal has struggled to get back above that level. 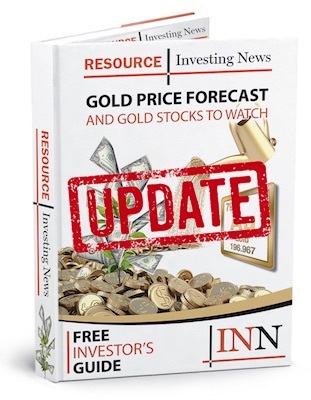 Speaking at the International Mining Investment Conference in Vancouver, Mercenary Geologist Mickey Fulp said that price drop could spell trouble for gold this summer. That said, Fulp isn’t worried. In fact, he considers the current gold price environment a potential blessing in disguise. “Certainly in gold stocks this could be a pretty nice buying opportunity,” he said. Watch the interview above for more insight from Fulp on the gold price and what the mining space could look like this summer. You can also read the transcript below. INN: We saw gold yesterday take a fall below $1,300 an ounce. What happened there? MF: Well, it looks like the Fed came out and made some pretty hawkish statements about interest rates, so the mid-term bonds, specifically the 10-year bond, went higher … and the dollar of course followed suit and went higher, and gold got slammed about $15 yesterday on New York open basically — a little bit before New York open had started. INN: Many people see $1,300 as a key psychological level for gold. I think yesterday was the first time we saw it go below that level this year. So does that spell trouble for gold this summer? MF: It could very much spell trouble, and you’re right it’s the year-to-date low. It was lower again today, it was $1,288 when I got up this morning, so it lost another $5 or $6. It’s broken that psychological resistance, and I haven’t really looked at 50- or 200-day moving averages, but I would imagine that it broke those too. So yeah, it does not bode well for gold this summer. INN: How should investors be feeling right now? Should they be worried about further gold price declines, or is this a buying opportunity? MF: I don’t worry. You know, I follow the old Alfred E. Neuman, Mad magazine, “what, me worry?” I don’t do that. There’s nothing you can do about it, so I don’t really see the sense in worrying about something you have no control over, you just need to deal with the paradigm you’re given. So certainly in gold stocks this could be a pretty nice buying opportunity. That said, we’ve got summer doldrums coming, and that’s even usually a lower period. But I’m looking at the price of gold right now, and I like to buy gold on dips. If this continues until the end of the week, I’m probably going to pop over to the bullion exchange and buy a couple of rounds of gold. INN: I like the optimism. You mentioned the summer doldrums right now, and you’ve spoken in the past about how summer is typically a slow time for the resource space in general. Are we gearing up for another slow summer? Are there any spots we might see more activity? MF: It’s always really hard to say, but yeah, the summer doldrums is usually not only a low season for metal prices, but for market activity. You know, by July and August it’s hard to find anybody in the office — in Vancouver, Toronto they’re all in their cottages; in New York they’re all in the Hamptons; and let alone what goes on in Europe, where those people usually take six weeks off. I think we’re probably in for a long, hot summer. INN: Investors — should they take a break right now as well, or are there things they should be doing? MF: I think if you have capital, you should deploy it discretionarily to stocks that are beaten down and have good fundamentals. Look at this simply as an opportunity, much like tax-loss selling would be in December.